The Division of Cancer Treatment (DCT) has as one of its major functions the development and clinical testing of new anticancer drugs. The Cancer Therapy Evaluation Branch of the DCT coordinates and monitors the clinical trials on these new anticancer drugs and is responsible for liaison with the Food and Drug Administration. One of the recent drugs developed and placed into clinical trial by the DCT is cis-platinum(II) diamminedichloride (NSC 119 875). 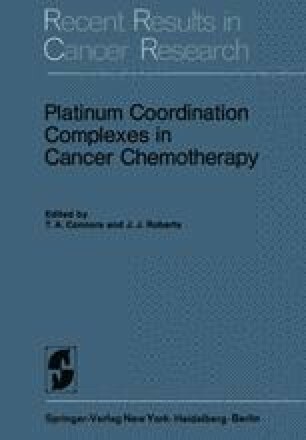 The purpose of this paper is to outline the major steps in the development of a new anticancer drug with emphasis on the techniques of clinical evaluation utilizing the platinum compound as the specific example.